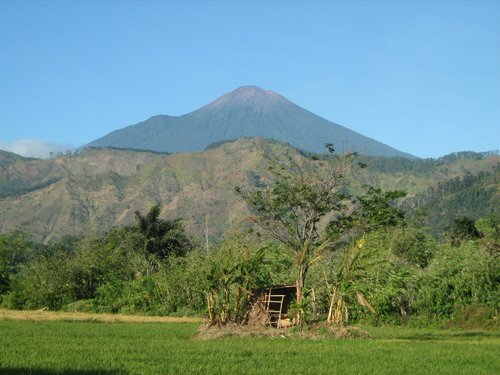 Mount Slamet or Gunung Slamet is an active stratovolcano in the Purbalingga Regency of Central Java, Indonesia. It has a cluster of around three dozens of cinder cones on the lower southeast-northeast flanks and a single cinder cone on the western flank. The volcano is composed by two overlapping edifices. Four craters are found at the summit. Historical eruptions have been recorded since the eighteenth century. Sindoro dan Sumbing merupakan dua Gunung yang letaknya berdekatan, serta memiliki bentuk dan tinggi yang hampir sama. Tinggi Gunung Sumbing sekitar 3.340 m dari permukaan laut (dpl), sedikit lebih tinggi daripada Sindoro (3.155 m dpl). Selain panorama alam nan indah, dengan udara sejuk dan segar, daerah-daerah dilereng Sumbing-Sindoro potensial dikembangkan sebagai kawasan agro wisata, terutama perkebunan kelengkeng, vanila, dan kopi. Kondisi alamnya hampir sama dengan kawasan Gunung Mas, puncak, Bogor. It’s a beautiful mountain. When you see below from its slope or its summit you’ll find an amazing scenery, farming lands, villages and towns (temanggung, parakan, and a little part of wonosobo). 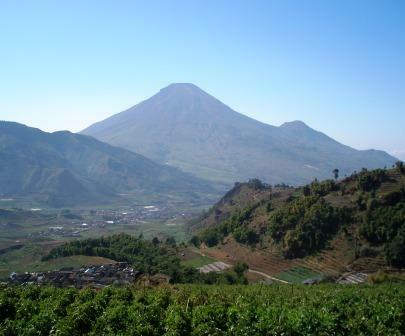 Mount Sindara, Mount Sindoro or Mount Sundoro is an active stratovolcano in Central Java, Indonesia. Parasitic craters and cones are found in the northwest-southern flanks, the largest is called Kembang. A small lava dome occupies the volcano’s summit. Historical eruptions mostly mild-to-moderate phreatic eruptions had occurred. 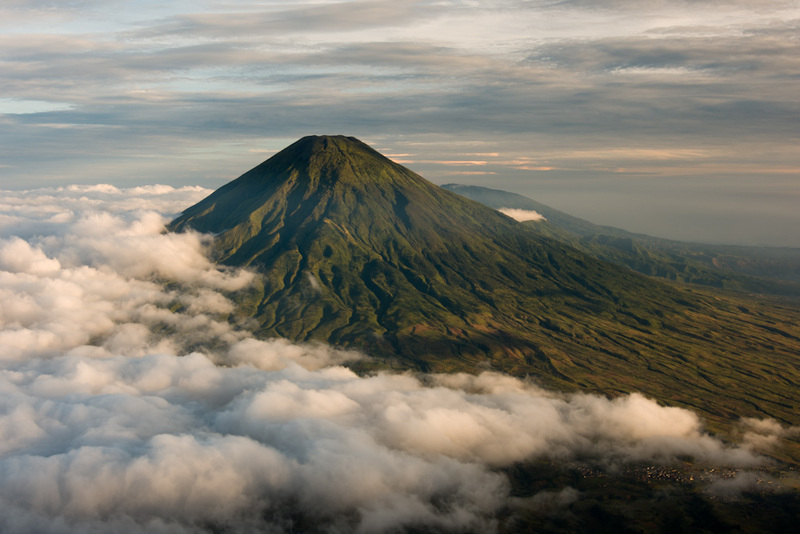 Mount Sumbing or Gunung Sumbing is an active stratovolcano in Central Java, Indonesia, symmetrical with Sundoro. The only report of historical eruptions is from 1730. It has created a small phreatic crater at the summit.